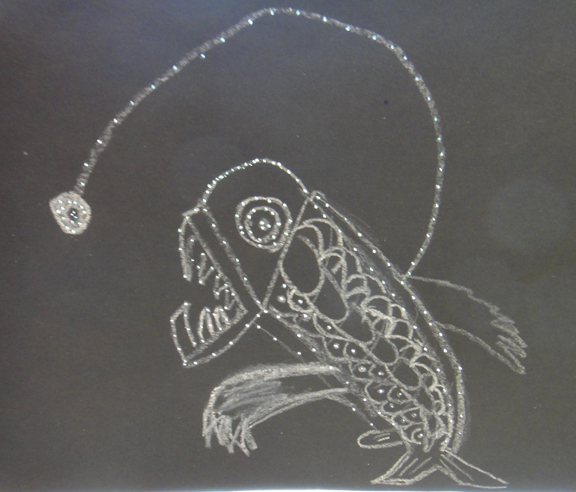 Check out the drawings of Mrs. Dougherty's talented students! Lots of visitors, friends, colleagues, and students came through the studio to kick the holiday season. ​Thank you all for coming and supporting my artwork! Meet the Mammals - 10 am to 4 pm. Science and art activities for everyone in the family. School of Oceanography - 12:30 pm. It was great to reconnect with colleagues at the School of Oceanography and to meet many talented graduate students intrigued by my presentation. The most well attended Birds at the Burke ever! Hundreds of bird specimens, live birds, science and art activities for the entire family. Including natural sciences illustrators at work! Great day discovering and drawing bugs of all kinds, sizes, colors, and origins at the museum with families from all over the world. 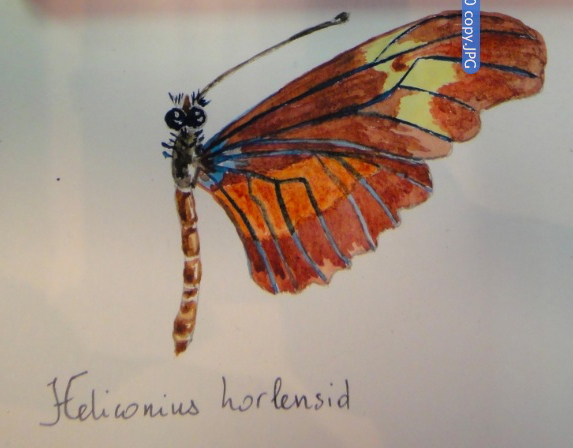 Museum and live specimens of thousands of Insects, arachnids, myriapods, and crustaceans. In the tradition of exploration naturalists, we explore 280 miles of the mighty Colorado River in rafts and wander canyon trails as we travel the river. I encourage rafting participants to join me in field sketching to make observations in the amazing landscapes that we traverse and discuss how artists perceive the natural world. The 6th grade students presented their geology field trip to parents and students from other grades. Lots of hard work, preparation, and fabulous presentations of their geologic adventures in Washington! 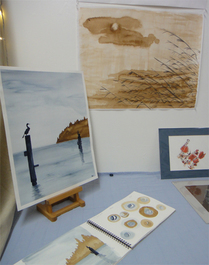 Gasworks Gallery Open Studio was well attended last night. I look forward seeing all of you at our next evening of art. 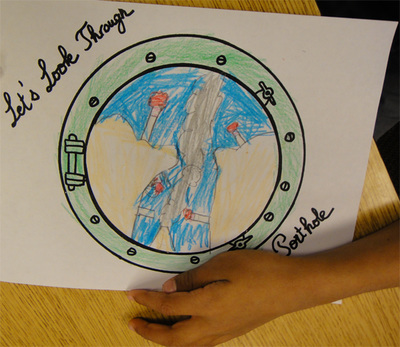 Seventy four 1st grade students followed me on a virtual dive to the seafloor to explore life in underwater volcanoes. They were very curious about diving at 7,000 feet in the ocean and loved the deep-sea spider crabs and the tubeworms. They also taught me a lot about the bioluminescent viperfish and were somewhat disappointed that I had never encountered one during my dives. French American School of Puget Sound, Mercer Island, WA. A great introduction to the geology of Washington on a 600 miles field trip with 6th graders from the French American School of Puget Sound. Thirty two students and four of their instructors experienced the roar of Snoqualmie Falls and the quiet of Dry Falls of Eastern Washington. They learned about the formation of a single lava flow and that of spectacular, basaltic columns on the Columbia River plateau. They witnessed today's mining in a gravel quarry and visited a 19th century gold mining village. They mapped outcrops of petrified wood, dug early Eocene fossils of trees, plants, flowers, insects and fish, and toured Grand Coulee dam. I enjoyed a day of seagoing work with the students of ORCA Cohort 11 that I had met earlier in January of this year. 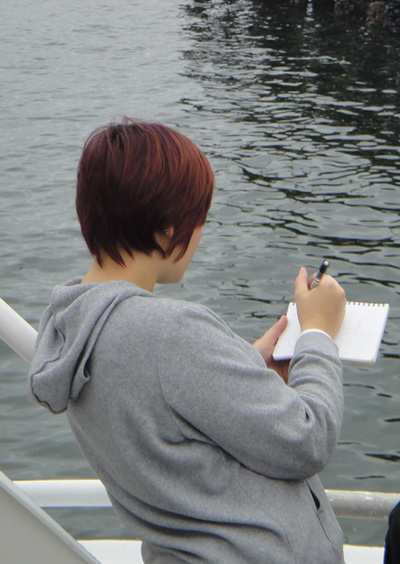 The students are now truly experienced sailors navigating the research vessel Phocoena, making observations of marine and land organisms, and collecting data in the waters off the coast of Everett. 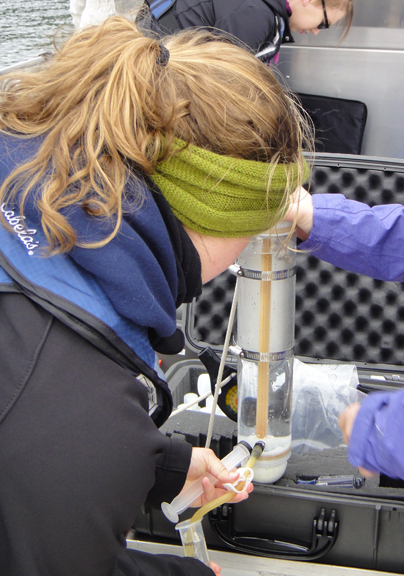 On their 85th monthly "State of Possession Sound" research cruise, these 1st year students monitor dissolved oxygen, temperature, salinity, and pH in the water column. 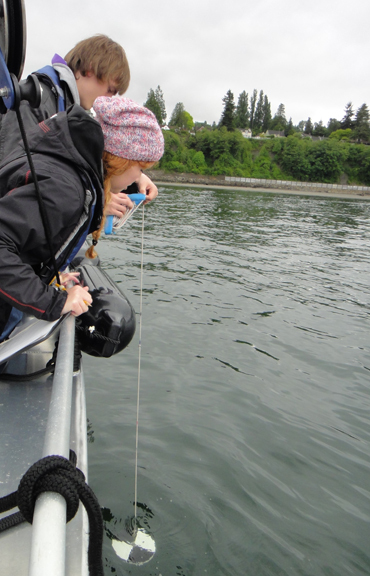 They also collect plankton and sediment samples in Puget Sound. Next year, they will refine their research question as they analyze data and collect more. Eventually they will present their research results at local and regional conferences to share their knowledge of marine environment that they study. On Friday May 15, cohort 10 will be well represented at the Undergraduate Research Symposium on the campus of the University of Washington. Student mapping in the field. 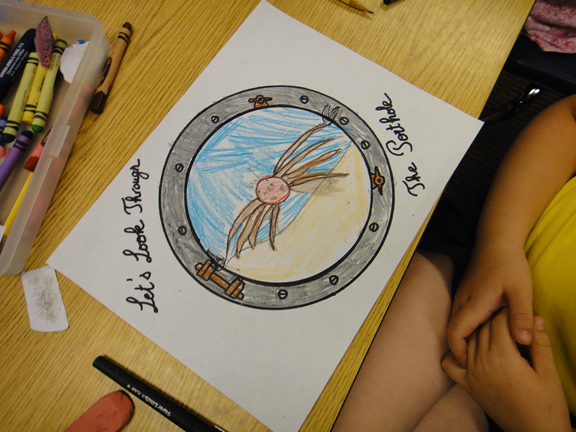 For my second artist in residence at IslandWood on Bainbridge Island I facilitated five art and sciences workshops. I first led staff, docents and graduate students who teach environmental sciences into the mapping activity. Then, I worked with 5th and 6th grade students who despite the rain and wind beautifully combined their artistic and scientific skills to map the beach at Blakely Harbor. "Axial Volcano - Wired and Restless!" Invited by UW former colleagues to attend this fascinating workshop on underwater volcano monitoring. Eighty geologists, biologists, geophysicists, chemists, oceanographers, engineers, deep-sea technology experts and communication engineers met to strategize and plan the best scientific questions that can be asked about this very active underwater volcano for the next two decades. A huge challenge and opportunity! The day after the workshop, Axial Volcano, started rumbling and an eruption occurred. Families learning about the mysteries of dinosaurs. "DINO DAY" ILLUSTRATOR - Burke Museum, Seattle, WA. 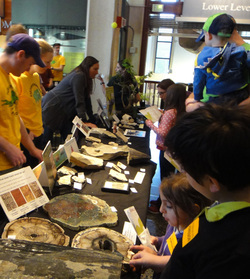 ﻿Community Event﻿ at the museum of natural history and culture. 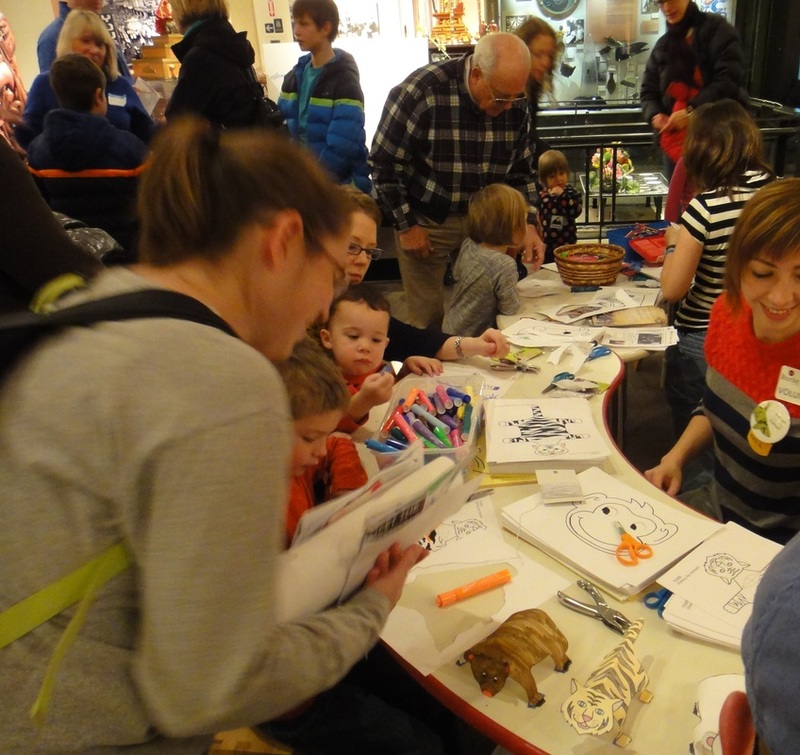 Scientific illustration demonstrations, sketching and children's activities for young dinosaurs fans. Baby dinosaurs exploring the jungle.